The gauge is intended to enable modellers to set up or check the buffer heights on locomotives, coaches and wagons. It includes a space to clear Alex Jackson couplings. There are two ends to the gauge, one with the generally accepted 14mm (3’6”) height and the other with the GWR dimension of 3’5½“ (13.83mm). The ends also have marks for buffer centres, a nominal 23mm (5’9”) at the 14mm end and again the GWR dimension of 5’8½" (22.83mm) at the other end. 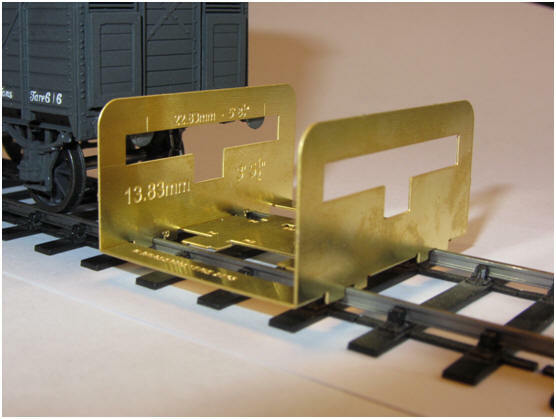 The gauge enables a quick and simple method of checking buffer heights ensuring buffer heights are comparable on all items of rolling stock which enhances running and helps prevents derailments. The gauge is placed on an appropriate piece of track either on or off the layout, ensuring the vertical sections are not resting on a chair or rail fixing. Place the item of rolling stock against the appropriate end of the gauge and, with your eye level with the upper edge of the slot, observe whether the centre of the buffers, buffer housings or holes in the buffer beam are in line with the upper edge of the slot. Adjustment is then made to the vehicle until they do align.